Many travelers plan their airport time like a highly coordinated commando mission—get in and get out as quickly as possible. 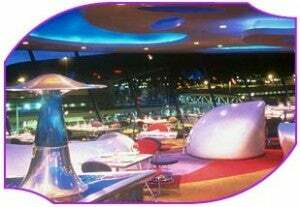 But more and more cities have stepped up their game in an attempt to transform their airports into cosmopolitan gateways that offer visitors a taste of the treats offered in their ports of call. 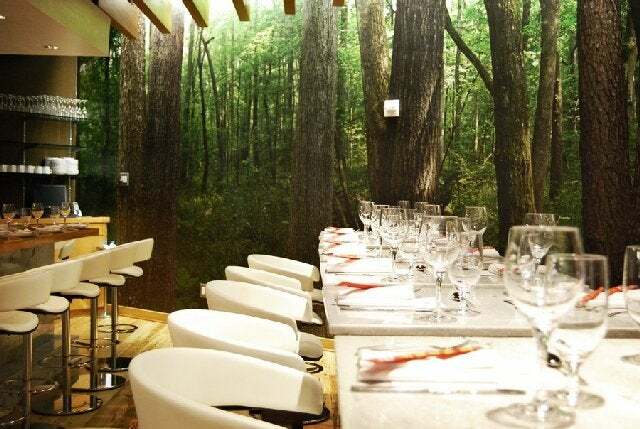 So whether an unavoidably long layover means time to kill, or your travel plans have dictated an early arrival at the airport, it can actually be a great opportunity to have a good meal that provides a window into that particular city’s culinary delights. Here are the top 10 restaurants at domestic airports. Flyers may want to opt out of Michelle Bernstein’s Delta BusinessElite menus and enjoy a delicious meal at One Flew South pre-flight instead. 1.One Flew South, Hartsfield-Jackson Atlanta International Airport, Terminal E:Since opening in 2009 as the “first upscale dining experience in the world’s busiest airport,” this instantly hot dining spot has earned raves, including a nod as one ofEsquire’s “Best Bars in America” in 2011. Featuring fresh regional ingredients dolled up into exotic international cuisine, One Flew South is particularly known for its sushi menu and takeaway – and, of course, delicious drink options that include plays on regional traditions, like the Basil Julep and the Georgia Bellini made with peach puree. Also taking delectable liberties with standard regional fare, dinner options include Pork Belly Sliders and Benton’s Bacon and Goat Cheese Salad, spotlighting one of the region’s finest purveyor of pork. Bonus: Not only has Chef Duane Nutter earned his stars and stripes onIron Chef America, he’s also a known standup comedian. Tortas Frontera at Chicago O’Hare. 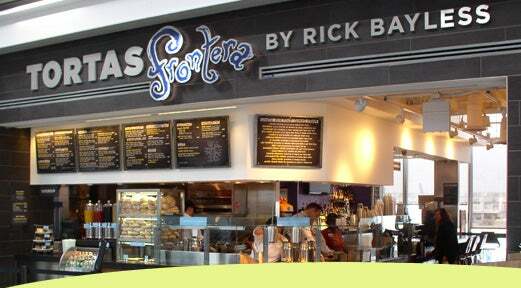 2.Tortas Frontera, Chicago O’Hare International Airport, Terminal 1, Gate B11; Terminal 3, Gate K4:Chicago may have long been known for deep dish pizza and Italian beef sausages, but a new flavor sensation is taking precedence of late, thanks to celebrity chef Rick Bayless, who made a name for himself hosting public television showMexico—One Plate at a Timeand as Bravo’sTop Chef Masterswinner. He expanded his award-winning restaurant empire this year with two O’Hare locations. Maintaining his commitment to Mexican cuisine prepared using the freshest ingredients provided by local farms, his menu boasts handcrafted tortas (Mexican sandwiches) stuffed with chipotle chicken and beer-braised beef short ribs and freshly prepared guacamole. Wash it down with a hand-shaken margarita. Legal Sea Foods has two airport locations at Boston Logan. 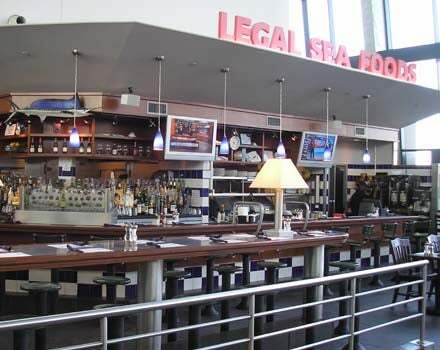 3.Legal Sea Foods, Logan International Airport, Terminal B (post-security) and Terminal C (pre-security):Boston boasts bounteous opportunities for noshing on the freshest possible seafood, including local standouts like oysters and clam chowder. The many Legal Sea Foods locations across the city are known for delivering high-quality dishes with a contemporary flair and precise attention to detail. The outposts at Logan Airport allow travelers to sample a well-curated selection of the restaurant’s fare, including its award-winning chowder, as well as lobster bisque, New England fried clams and the restaurant’s signature crab cakes. Not to mention the chance to tuck into a full steamed lobster dinner, or a freshly shucked lobster roll. Other draws include gluten-free and kid’s menus, as well as a full bar. An added draw: the restaurant’s refined décor is restful compared to the hustle and bustle of airport travel. The Salt Lick’s Austin Airport location also has a taco bar. 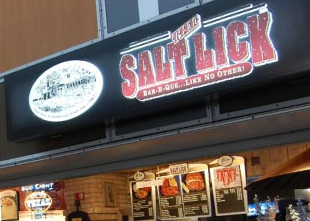 4.The Salt Lick, Austin-Bergstrom International, West Concourse, Gate 12:Begun as a standalone barbeque pit in Driftwood, a town in the Hill Country of central Texas, the original Salt Lick location boasts nearly fifty years of family tradition and recipes packed into a menu that tempts visitors with the likes of brisket and pork ribs, plus a simple assortment of the side dishes pretty much universally accepted as the perfect flavor accompaniments to barbecued meat—Cole slaw, beans and potato salad. At the airport location, the restaurant clan also brings their love of meat to a taco bar, which offers brisket or pulled pork with eggs in their breakfast tacos in the a.m., as well as options sans eggs for lunch and dinner. There is a second airport location at the Central Terminal, Gate 10. Deep Blue Sushi at Jetblue’s Terminal 5 comes courtesy of Buddakan chef Michael Schulson. 6. Deep Blue Sushi, JFK International Airport, Terminal 5, Post-security:Sushi is not the first cuisine that generally gets mentioned when it comes to either standout airport food, but the menu at Deep Blue Sushi was created by Chef Michael Schulson of revered Asian-fusion eatery Buddakan in the Chelsea Market in Manhattan, and has become something of a legend in its own right. The restaurant’s blue tiles create a cool, modern atmosphere while the varied menu includes sushi and udon soup, as well as heartier options like Pad Thai and fried rice, plus a full bar and an “On the Fly” option that features fresh sushi and sashimi to go. Ivar’s at Seattle uses the same recipes originated by founder Ivar Haglund in 1938. 7.Ivar’s, Sea-Tac International Airport, Pacific Market Place, Central Terminal:While the airport location does not allow diners to take part in a tradition popular at the original pier-front restaurant – buying extra French fries to feed the squawking sea gulls – it does offer the same fabulously fresh fruits of the sea. They are proud to only serve halibut, salmon and Pacific True cod caught by a vessel known as the Katie Ann, and all fish is hand-cut and breaded daily, using the same recipes originated in 1938 by founder Ivar Haglund. The main attraction is the classic combo of fried seafood and chips, with some interesting additions to the standard fish ‘n chips (here done in Pacific True Cod), including the fish for which the region is best known: Pacific salmon ‘n chips. For those seeking a slightly less decadent (i.e. not fried) option, they also serve grilled platters featuring salmon or halibut, and Caesar salads with a variety of seafood toppings, including salmon and crab. Ike’s Food and Cocktails in Minneapolis – try their famous Bloody Mary. 8.Ike’s Food and Cocktails, Minneapolis-St. Paul International Airport, Post-security:Old-school ambiance reigns in both the décor and menu at this upscale steakhouse spun off from the popular location in downtown Minneapolis, which has a 1940’s theme. In addition to the requisite steak options, other classic dishes include French dip sandwiches and burgers, as well as standard sides along the lines of thin cut French fries. Of course a classic meal calls for a classic cocktail, and the downtown location, at least, is particularly known for its stellar Bloody Mary. 42nd Street Oyster Bar at Raleigh Durham. 9.42nd Street Oyster Bar, Raleigh-Durham International Airport, Terminal 2, Near gate C1:An outpost of the downtown location, which began serving oysters in 1931, this seafood-friendly haven features oysters just about any way it’s possible to eat them, including on the half shell, Rockefeller, fried, and steamed (served regular or spicy); plus regional favorites like crab cakes and blackened or fried catfish. The restaurant gets most of its seafood from its own fleet of ships on the coast. But also serves burgers and pasta for those who prefer the turf to the surf. For travelers who pass through in the morning, the breakfast menu is also full of abundant seafood options, including a Chesapeake Benedict featuring lump crab meat, and an oyster option, served on Low-Country-style grits, cooked in tasso gravy. Beaudevin at Miami International Airport. 10. 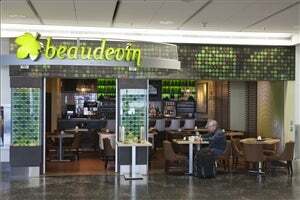 Beaudevin, Miami International Airport, Terminal D, Near Gate 24:Opened in early 2011, this 42-seat wine bar pays direct homage to the Brussels Airport wine bar of the same name. 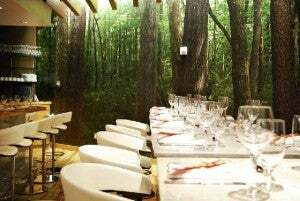 A fairly large selection of vino is offered in the restaurant’s wine-tasting section, and while the wine list is not particularly adventurous, it does offer a wide range of reliable international options. The menu, created by Boston-based celebrity chef Todd English, includes tapas items like Serrano ham & mozzarella, caprese skewers, charcuterie and artisan cheese plates, available for sit-down meals and takeaway. Also of note are the new Beaudevin location that was just debuted in early 2012 at Chicago’s O’Hare, and the location slated to open at the San Diego International Airport in 2013. « Paying College Tuition with a Credit Card – Worth It?